Long Journey's End is the sole story mission of the Darker Side in Super Mario Odyssey, and is the final mission of the game. The objective is to collect the final Multi Moon. The mission begins on the Moon, along with various characters. Mario must move along, then capture a frog and jump across platforms to enter a Warp Pipe leading to an area with many Goombas and a Yoofoe. Defeating the Yoofoe will spawn a Life-Up Heart. After defeating or bypassing the Yoofoe, Mario must jump across sinking platforms and climb sinking poles. 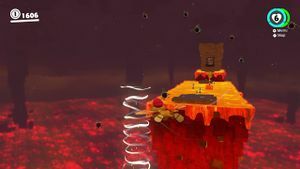 Soon after, Mario must Long Jump across platforms moving across the lava, then capture a Lava Bubble to move across the lava while watching out for Moonsnakes. After taking a lava cannon, Mario must capture an Uproot and keep moving up the tower while avoiding Burrbos. The next segment features moving freezing water, as well as some Fuzzies that must be avoided. Next, Yoshi will be encountered, and Mario must capture him so that he can use Yoshi's tongue to climb up the nearby walls. Mario must then hit a P Switch and follow the flower path while throwing Cappy at the Pulse Beams. Mario can also optionally solve the Sphynx's riddle; doing so will grant access to another Life-Up Heart; answering any additional questions correctly will grant Mario many Coin Stacks. In the next area, Mario must throw Cappy at a Scarecrow and platform up the appearing pillars. Afterwards, Mario must capture Glydon and ride him into the updrafts while avoiding Urban Stingbies to reach the next area. Mario must then venture across the Volbonan Poles to get to the next Warp Pipe. Next, Mario must ride a platform with a Pulse Beam on it while fending off Burrbos that leap on the platform. When the platforms stop, Mario must capture a Pokio and ride pendulum-like platforms to the top. Mario can then enter an 8-bit section, and avoid Barrels and hit four ? Blocks below the original Donkey Kong to reach the next area. Mario must then travel towards a painting to capture Bowser, then make it past a longer section with boulders firing out from holes. At the end of that section, Mario will de-capture Bowser, and must capture a series of spark pylons that spell "THANK YOU". After heading into one final Warp Pipe, Mario is transported back to the Moon and in front of a grayscale version of the New Donk City Hall. Behind the skyscraper are numerous Coin Stacks. Mario must capture one last frog to jump to the top of the Hall, then climb up the rest of the way to collect the Multi Moon as Cappy reminisces about the experience. There are no checkpoints throughout the entire level, so dying results in starting all the way back at the first section with the Goombas and Yoofoe. Click on a Power Moon icon under a kingdom to see a list of all Power Moons in that kingdom. Click on a regional coin icon under a kingdom to see a list of all regional coins in that kingdom. Road to Sky Garden • Flower Thieves of Sky Garden • Path to the Secret Flower Field • Defend the Secret Flower Field! The Scourge on the Skyscraper • A Fresh Start for the City • A Traditional Festival! The Glass Is Half Empty! The Broodals Are After Some Cookin' • Under the Cheese Rocks • Big Pot on the Volcano: Dive In! • Climb Up the Cascading Magma • Cookatiel Showdown! Battle with the Lord of Lightning! This page was last edited on November 1, 2018, at 14:24.